ROCHESTER – February 1, 2018 – The City of Rochester was one of the many municipalities that observed a nationwide Moment of Silence on February 1, 2018. The Moment of Silence honored Echol Cole and Robert Walker, two Memphis, TN sanitation workers who were crushed to death 50 years ago by the compactor of their garbage truck. Their deaths sparked the walk-out of 1,300 fellow sanitation workers, all members of the American Federation of State, County and Municipal Employees (AFSCME) Local 1733. That pivotal strike brought Dr. Martin Luther King Jr. to Memphis in April of 1968 to support the sanitation workers’ cause. 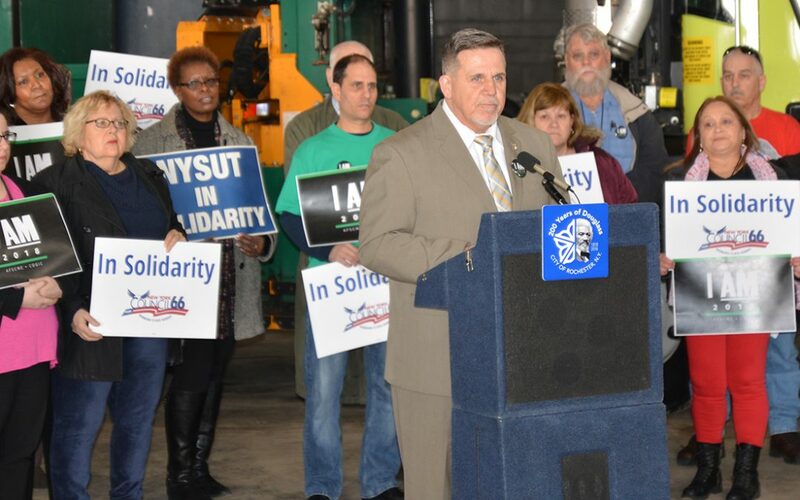 The Moment of Silence event held today in Rochester was co-sponsored by AFSCME Local 1635 and the City of Rochester. The anniversary was observed at the Mt. Read Operations Center in the Maplewood neighborhood, and was open to members of the public and all unions members in the region. The Moment of Silence is part of a broader I AM 2018 campaign, jointly sponsored by AFSCME and the Church of God In Christ (COGIC). AFSCME and COGIC launched the I AM 2018 campaign to honor the Memphis sanitation workers and Dr. King., in observance of the 50th anniversary of the strike and the assassination of Dr. King on April 4, 1968. The I AM 2018 campaign is a grassroots voter education and mobilization campaign that will train thousands of activists to create change in their communities and carry on the legacy of Dr. King and the sanitation workers. Nationwide, AFSCME locals, faith-based groups, municipal governments, public officials, civic groups and other organizations observed this Moment of Silence on February 1 with a variety of events in their respective communities. Participants also observed the passing of longtime AFSCME leader and progressive activist Paul Booth, who was a key strategist on the I AM 2018 campaign and the chief architect behind the Moment of Silence. “I AM A MAN” was the slogan that the 1968 striking sanitation workers adopted to shine a light on their degrading working conditions and to assert their humanity. The I AM 2018 campaign will continue the unfinished work of confronting prejudice, poverty and advancing the freedom of all working people today.